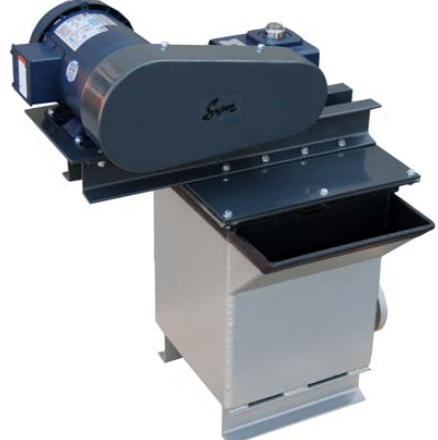 SEPOR’s attrition scrubbers range in size from 1 to 3 cubic foot cells, with up to four multiple cells per bank. This size range is particularly suitable for pilot plant projects, environmental remediation projects and small production operations. 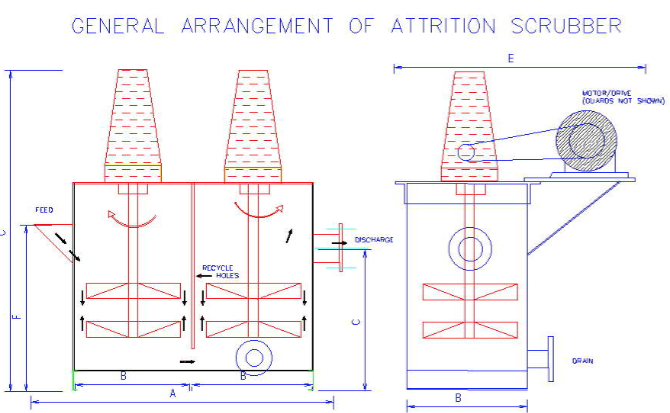 The attrition scrubbers have two opposed axial flow propellers (100% and 150% pitch) to create a high intensity impact zone between these propellers. Each particle is violently impacted with many other particle surfaces many times before discharge from the vessel. The actual scrubbing time is dependent upon residence time in the attrition scrubber. Single cell attrition scrubbers may be operated as batch units. Multiple cell attrition scrubber units are designed to create a continuous flow through the bank of cells. The discharge from the first cell is forced down and under the propellers of the second cell, where the flow is upward and is discharged to the top of the third cell. This alternating flow pattern assures an even conditioning and efficient flow pattern throughout a multiple cell scrubber unit. SEPOR Attrition scrubbers have found applications in mineral processing, industrial processes and chemical processes where an intensive particle surface to surface action is required to either change the surface properties of the particle or to remove contaminants or valuable products from solid particles. Examples of actual applications include: removal of contaminants from glass sands; upgrading uranium ores by separating high grade slimes from low grade sands; removal of clay slimes from potash, phosphate and other ores; changing surface properties of solids prior to flotation, both by particle to particle interaction and by chemical conditioning; removing contaminant particles or chemicals from soils in soil remediation projects. Tanks are welded mild steel construction, have a feed box and flanged discharge and drain outlets. Multiple cells may be furnished as 2 cell units (closed flow design) with a flanged discharge between the second two units. Alternatively, the attrition scrubbers may be configured in the standard method (open flow), with cells in line and flow between the cells. Gear reducers provide the ideal speed for each diameter propeller and are totally enclosed. Propeller assemblies are comprised of opposed axial flow propellers covered, permanently fixed to a shaft, also covered with rubber or neoprene. V-belt drives are of a fixed speed. Drive guards are closed type guards.